TAIPEI —Philippine President Rodrigo Duterte is rebalancing his foreign policy away from old ally the United States to former U.S. Cold War foes China and Russia, in a move that may generate a windfall of aid for the developing Southeast Asian country. Duterte said last month his country would reject U.S. military aid in patrolling the contested South China Sea and fighting a violent Muslim rebel group in his archipelago’s south. The Philippines will cross to “the other side of the ideological barrier,” and work on alliances with China and Russia, the 71-year-old president was quoted telling reporters last week. China has said it wants talks with Duterte’s government, which took office June 30, to settle a knotty maritime sovereignty issue. Duterte sent an envoy to Hong Kong in August to start making amends. China is likely to provide infrastructure financing for projects the Philippines “so sorely needs,” said Carl Baker, director of programs with the think tank CSIS Pacific Forum. Beijing has already helped build infrastructure in other poor regions of Southeast Asia, from a pledged $6 billion railway in Laos to Cambodia’s first oil refinery, leading to speculation the Philippines may be next. Duterte has also said the Philippines would stop working with the U.S. Navy in patrolling the disputed South China Sea after two years of joint exercises. He also asked U.S. military advisers last month to leave Mindanao, the southern island where Philippine forces have stepped up a battle against Muslim insurgents since July. Who would have thought that the Philippines would have moved towards China? But it is not just in the Philippines that leaders are upset with the USA. Yet, this is not all. The Germans have been very upset since learning how much the Snowden leaks revealed that the USA was spying on it, both for military and economic purposes (see The Snowden Leaks are Leading to the Destruction of the USA). Some will say, so what? But the Germans are really upset with the USA. As reported here a couple of weeks ago, the protests in Germany against the TTIP agreement were mainly related to anti-Americanism (see TTIP & CETA protests show European anti-Americanism). Notice that some in Germany believe that the EU has been stupid in overly trusting the USA. Notice that the Germans are incensed with both the USA and the UK. Many Germans will long remember this and decide that they will always have to mistrust the USA, despite future assurances by the USA. And they want their own espionage system (cf. Revelation 13:15-18). 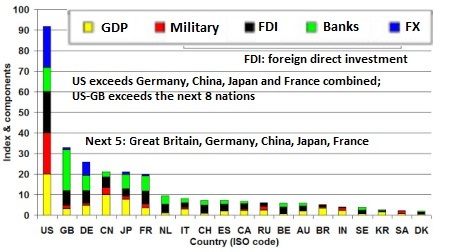 Notice that this chart basically shows that the world’s finances are dominated by the USA and the United Kingdom (abbreviated as ‘GB’ for Great Britain above). It will not stay this way! Many people want to change the current world order. Furthermore, China just got its currency to have Special Drawing Rights (SDR) with the International Monetary Fund (IMF, see G20, SDR, China, & JR’s ‘Timetable for the Dollar’s Demise’). Despite the current situation, the President of the Philippines sees China as offering Philippines more opportunity for a time. And the Germans (abbreviated as ‘DE’ above) believe that the USA is trying to stop them from rising further. Whether Donald Trump wins or not, his rise is giving some in Europe a reason for Europe to distance itself from the USA as well as to work for its own army. The Brexit vote in the UK has also effectively reduced the UK’s ability to veto the type of European military that many leaders in Europe want. Prophecy reveals that Europe will end up with a “great army” (Daniel 11:25). The Bible tells of the final time of the Gentiles. (Luke 21:23-24; Revelation 11:2), which means the time when the descendants of Israel will no longer dominate the world scene. Growing anti-Americanism will be a factor in the rise of the end time European, King of the North, Beast power. A power that will destroy not only the USA (Daniel 11:39), but also (directly and/or indirectly) its Anglo-Saxon descended allies such as the UK, Canada, Australia, and New Zealand (Jeremiah 30:7; Daniel 8:24). This entry was posted on Monday, October 3rd, 2016 at 7:00 am	and is filed under Prophecy.